In the passage from new media and tabloid culture, over political spin, branding and experience economy, to city scapes, design, and art in contemporary society, visual culture—visuality, ‘the visual’, ‘the image world’—is a key denominator. The book is the first volume of the project Transvisuality in three volumes, initiated by University of Copenhagen and Liverpool University Press. It collects leading scholars from all parts of the world in a scrutiny of what the visual means today. It builds on the debates on visual culture and visuality in the past decades studies of culture, but expands on these debates from the perspectives of theory, analysis and design. It shows how the visual impacts on the current world and transcends the most different aspects of the social: how the visual becomes transvisual by adapting and creating culture in the global, translocal world. It ultimately addresses the pervasive but puzzling claim of contemporary research that ‘the world has become more visual’ and tries to answer it. In the first volume the issue of the dimension of the visual is a paramount theme, seen from different interdisciplinary angles. Whether approaches are prone to nominalism and discourse or to issues of cognition and framing, the question of what the visual is and what impacts may pertain to it remains a fundamental challenge to cultural research. 1. 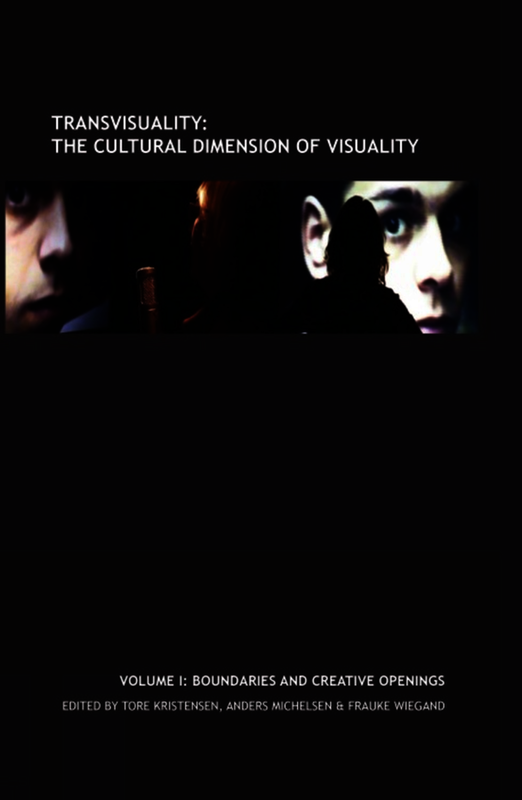 The book presents a number of high-level theoretical arguments within established research into the visual and visual culture that point to transvisuality. 2. The book collects new approaches to how to define the visual as transvisuality, ranging from phenomenology, semiotics, studies of the imagination, art history, to frame theory, visual practice and visual literacy. 3. The book is a handbook based on new basic research into the visual and thus address anyone interested in the visual, from the postgraduate student to professionals in visual communication. 4. The book brings together leading international scholars and their views on the visual and visual culture today. Notes on Contributors Chiara Cappelletto is Assistant Professor of Aesthetics at the Università degli Studi in Milan, Italy. Her research focuses on the philosophy of image, visual culture and aesthetics of theatre, paying particular attention to the latest findings in neuroscience. She has written several articles on the role of fiction and make-believe in the construction of the spectatorial relationship. Her publications include Figure della rappresentazione: gesto e citazione in Bertolt Brecht e Walter Benjamin, Milano 2002; Il rito delle pulci. Wittgenstein morfologo, Milano 2004 (IX Castiglioncello Prize for Philosophy, youth section); Neuroestetica. L’arte del cervello, Roma – Bari 2009. Eduardo de la Fuente teaches in the Sociology Program, Flinders University, Adelaide Australia. He recently published a book entitled, Twentieth Century and the Question of Modernity (Routledge, 2011) and co-edited with Peter Murphy, Philosophical and Cultural Theories of Modernity (Brill, 2010). Recent articles in journals such as Classical Sociology, Sociological Theory, Cultural Sociology and the Journal of Sociology have focused on Simmel and aesthetics of social life; the current state of the sociology of arts; and Classicism and Romanticism in the social sciences. At the moment he is working on two major projects: a book on the 'social sciences and art theory' that seeks to bring disciplines like sociology into dialogue with art history, philosophical and empirical aesthetics; and an empirical research project regarding the rise of 'neomodernism' in contemporary architecture and design, and associated lifestyle media. Nicoletta Isar is Associate Professor at the Institute of Art History, Department of Arts and Cultural Studies at Copenhagen University. She has studied in Bucharest, Paris, and Toronto, and she hold 3 degrees (International Relations; Arts; Musicology -Violin performance), and a doctorate (docteur ès lettres) in Byzantine studies (Sorbonne, Paris IV, 1996). Her research areas spans from Comparative studies in the history of mentalities to Ritual Performances and Anthropology of Image. Recently she became interested in phenomena of saturated vision, changes in perception of time, and the transvisual, within the anthropological frame underlying transformations in vision, time, space and body. Martin Jay is Sidney Hellman Ehrman Professor of History at the University of California, Berkeley, where he teaches Modern European Intellectual History, Critical Theory, and visual culture.. Among his works are The Dialectical Imagination (l973 and l996); Marxism and Totality (l984); Adorno (l984); Permanent Exiles (l985); Fin-de-Siècle Socialism (l989); Force Fields (l993); Downcast Eyes (l993); Cultural Semantics (l998); Refractions of Violence (2003); Songs of Experience (2004); The Virtues of Mendacity: On Lying In Politics (2010) and Essays from the Edge (2011). Tore Kristensen is Professor in Strategic Design at Copenhagen Business School, Denmark, affiliated with the Center for Design and Business Development - CDV and Imagine... Creative Industries Research. His latest research areas include creativity and design, consumers' value creation, and transformations of users as created by cultural institutions in art, science, play and culinary experiences. Latest publications include 'The Physical Context of Creativity', in Creativity and Innovation Management, 13.2 (June 2004); together with G. Gabrielsen, R. Wilke, L. Kahle and T. Plenborg, 'Is good design good business? ', in G. Rusten and J.R. Bryson (eds. ), Industrial Design and Competitiveness: Spatial and Organizational Dimensions (Palgrave Macmillan 2009); and together with G. Gabrielsen and J.L. Zaichkowsky 'Whose design is it anyway? Priming designer and shifting preferences', International Journal of Market Research, 52.1 (2010). Max Liljefors is an Associate Professor in Art History and Visual Studies, at Lund University, Sweden. His current research project is called 'Anatomy in the Expanded Field: Epistemology, Aesthetics and Ethics in Contemporary Medical Imaging', and deals with how the advances of the biosciences and bio-imaging change our understanding of human corporeality, inside and outside of science. He has recently concluded the project 'Body and Authority in Contemporary Art', about clashes and affinities between art and law. He has previously conducted research about the representation of the Holocaust, historical consciousness in visual culture, video art, etc. Morten Meldgaard is a Danish Architect and Film-director and has written a Thesis on film and architecture entitled ”Clocks for Seeing” (2009). Furthermore he has recently finished the feature length documentary ”Kim” and a two volume CD entitled ”Soundtrack_Remix” (2010). He is Assistant Professor at the Institute of Design and Visual Communication, Royal Danish Academy, School of Architecture, Design and Conservation and teaches both at the School of Architecture and the National Danish Film School. Anders Michelsen is Associate Professor at the Department of Arts and Cultural Studies, University of Copenhagen, where he coordinated the first master program in Visual Culture Studies in Denmark. His research-topics and interests lie within the interdisciplinary field emerging from contemporary art and culture, design and technology, history and globalization, especially as related to visual culture, design, computer media, and creative imaginaries. He has among others co-authored Designmaskinen. Design af den moderne verden [The Design Machine. Design of the Modern World] (1999) and contributed to Kunstteori. Positioner i nutidig kunstdebat [Art Theory. Positions in Contemporary Art Discourse] (1999). He is director of the PeaceWare-platform and co-director of PeaceWare-Somaliland (http://www.peaceware.net/) which focuses on participatory action research in ICT4D. Having worked as a freelance art critic, he is on the board of Atlantica Revista de Arte y Pensamiento, Gran Canaria, Ekfrase: Nordisk Tidsskrift For Visuell Kultur, Bergen and Øjeblikket, Copenhagen. Peter Murphy is Professor of Creative Arts and Social Aesthetics at James Cook University. He is co-author with Simon Marginson and Michael Peters of the trilogy Creativity and the Global Knowledge Economy, Global Creation, and Imagination. Murphy’s other recent books include Dialectic of Romanticism: A Critique of Modernism (with David Roberts) and Civic Justice: From Greek Antiquity to the Modern World. He is editor with Eduardo de la Fuente of Philosophical and Cultural Theories of Music. Luc Pauwels is a Professor of Visual Culture at the University of Antwerp, Belgium. He is the director of the ‘Visual Studies and Media Culture Research Group’ and Vice-President of the International Visual Sociology Association (IVSA). As a visual sociologist and communication scientist, he published on visual research methodologies, visual ethics, family photography, website analysis, anthropological filmmaking, visual corporate culture and scientific visualization in various international journals. Books include Visual Cultures of Science (UPNE, 2006), The Sage Handbook of Visual Research Methods (2011, together with Eric Margolis), and a forthcoming monograph with Cambridge University Press: Reframing Visual Sociology. Klaus Sachs-Hombach is Professor at the Department of Media Research, Technical University Chemnitz, Germany. He studied philosophy, psychology and German philology in Münster and was appointed Professor for Philosophy with a focus on cognitive science in 2003. He is founder of the internet platform ‘Virtual Institute for Image Science’ (VIB), the online journal IMAGE. Journal of Interdisciplinary Image Science and the Society for Interdisciplinary Image Science (GIB). His research interests include image, sign, media and communication theories; aesthetics & culture theory, philosophical problems in psychology, history of psychology & cognitive science. Among his works are Bildwissenschaft, Disziplinen, Themen, Methoden (2005) and Bildtheorien, Anthropologische und Kulturelle Grundlagen des Visualistic Turn (2009). Frederik Stjernfelt is Professor at the Center for Semiotics at Aarhus University, Denmark, He is editor of the journal KRITIK and member of the Danish Academy and the Royal Danish Academy of Sciences and Letters. He published his post.doc.dissertation Diagrammatology. An Investigation on the Borderline of Phenomenology, Ontology, and Semiotics (Springer, 2007); edited with Peer Buindgaard the four volume reader Semiotics. Critical Concepts (Routledge, 2010) and published papers in Synthese, Semiotica, Sign System Studies, Zeitschrift für Semiotik, etc. The Democratic Contradictions of Multiculturalism (with Jens-Martin Eriksen) is to appear in 2012. Barbara Tversky studied cognitive psychology at the University of Michigan and taught at the Hebrew University of Jerusalem and many years at Stanford University. She is currently Professor Emerita at Stanford and Professor of Psychology at Columbia Teachers College. Her research interests and collaborations include memory, thinking, spatial language and thought, diagrammatic reasoning, visual communication, gesture, event perception and cognition, and embodied and situated cognition, with applications to design, the sciences, education, computer science, engineering, linguistics, and philosophy. Trond Waage is associated professor at Visual Cultural Studies (VCS) at the Department of Archeology and Social Anthropology at University of Tromsø, Northern-Norway. He is the head of the Programme board at VCS. Waage holds a Ph.D in Social Anthropology (2002) with specialization in Visual Anthropology. He has done research in Northern Norway and Northern Cameroon, where he has explored the themes of youths, urbanization, ethnicity, gender, religion and visual anthropology. Waage has initiated a self-reflexive film course for youth at risk, ‘Youth gaze’. He is a board member of ‘Nordic Network for Visual Studies’. Michael Walsh works in the Australian Bureau of Statistics, Canberra, Australia. He was recently awarded a PhD for a thesis, entitled, Musical Listening and Social Boundaries: Framing ‘Public’ and ‘Private’ Social Life Through Sound, School of English, Communications and Performance Studies, Monash University, Melbourne, Australia. He has published articles in journals such as The Australian Journal of Communication and Studies in Symbolic Interaction. Frauke Wiegand is a PhD student at the Department of Arts and Cultural Studies, University of Copenhagen. She is writing her thesis on the dynamics of cultural memory formation in the post-colonial tourist practice and mobile visual culture, with research interests in post-colonial thinking, global im/mobilities, and imaginaries and ideas of Africa, Europe, and the South in contemporary media and arts. Hellmut Winter is a doctoral candidate and scientific assistant at the Department of Pedagogy, Technical University Chemnitz. Born 1979, studied philosophy, psychology & political science in Berlin. Since 2008, he's the editor of the journal ‘Das Argument’. He is researching in social philosophy, culture theory, Critical theory. Jean-Jacques Wunenburger is Professor of Philosophy at the University Jean Moulin in Lyons, France, and former director of the Centre Gaston Bachelard de recherche sur l’imaginaire et la rationalité. His work relates in particular to problems of rationality, image, imagination, imaginary and to aesthetic, political and moral philosophy. Among his works are La fête, le jeu et le sacré (1977), L'utopie ou la crise de l'imaginaire (1977), L'imagination, Que sais-je? (1991), Méthodologie philosophique (1992), La vie des images (1995), Philosophie des images, (1997), Imaginaires du politique (2001) and Imaginaires et rationalité des médecines alternatives (2006). Notes on Contributors Chiara Cappelletto is Assistant Professor of Aesthetics at the Università degli Studi in Milan, Italy. Eduardo de la Fuente teaches in the Sociology Program, Flinders University, Adelaide Australia. Nicoletta Isar is Associate Professor at the Institute of Art History, Department of Arts and Cultural Studies at Copenhagen University. She has studied in Bucharest, Paris, and Toronto, and she hold 3 degrees (International Relations; Arts; Musicology -Violin performance), and a doctorate (docteur ès lettres) in Byzantine studies (Sorbonne, Paris IV, 1996). Martin Jay is Sidney Hellman Ehrman Professor of History at the University of California, Berkeley. Tore Kristensen is Professor in Strategic Design at Copenhagen Business School, Denmark. Max Liljefors is an Associate Professor in Art History and Visual Studies, at Lund University, Sweden. Morten Meldgaard is a Danish Architect and Film-director. Anders Michelsen is Associate Professor at the Department of Arts and Cultural Studies, University of Copenhagen. Peter Murphy is Professor of Creative Arts and Social Aesthetics at James Cook University. Luc Pauwels is a Professor of Visual Culture at the University of Antwerp, Belgium. Klaus Sachs-Hombach is Professor at the Department of Media Research, Technical University Chemnitz, Germany. Frederik Stjernfelt is Professor at the Center for Semiotics at Aarhus University, Denmark. Barbara Tversky studied cognitive psychology at the University of Michigan and taught at the Hebrew University of Jerusalem and many years at Stanford University. Trond Waage is associated professor at Visual Cultural Studies (VCS) at the Department of Archeology and Social Anthropology at University of Tromsø, Northern-Norway. Michael Walsh works in the Australian Bureau of Statistics, Canberra, Australia. Frauke Wiegand is a PhD student at the Department of Arts and Cultural Studies, University of Copenhagen. Hellmut Winter is a doctoral candidate and scientific assistant at the Department of Pedagogy, Technical University Chemnitz. Jean-Jacques Wunenburger is Professor of Philosophy at the University Jean Moulin in Lyons, France, and former director of the Centre Gaston Bachelard de recherche sur l’imaginaire et la rationalité. Recommended. Graduate students through faculty/researchers. Tore Kristensen is Professor of Strategic Design at Copenhagen Business School. Anders Michelsen is Associate Professor of Visual Culture at the University of Copenhagen. Frauke Wiegand is PhD fellow in Visual Culture at the University of Copenhagen.